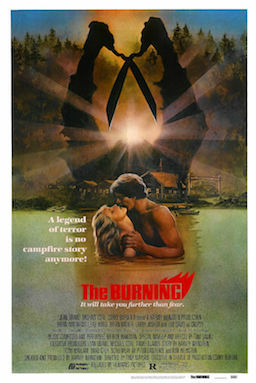 This week, a look at the exemplary summer camp slasher, The Burning. The horror is based on a New York state urban legend, Cropsey. Legendary effects guru Tom Savini (Maniac/Dawn of the Dead) is the man behind the awesome effects here. For a slasher, there’s a lot of investment in the characters in The Burning…and why not? We’ve got the likes of Holly Hunter, Fisher Stevens, and yes…George Costanza himself, a hirsute Jason Alexander.